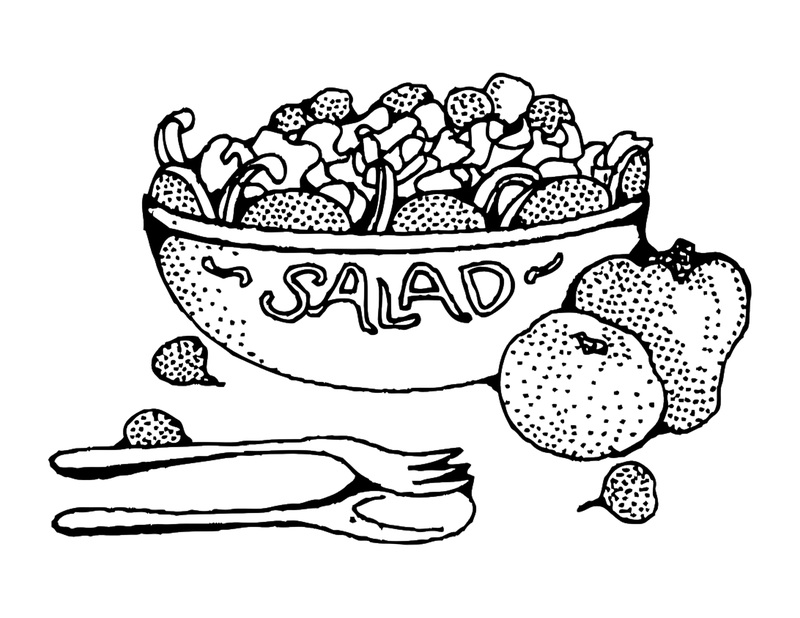 Healthy Food, Fun? You Betcha! Does your child turn up his nose at vegetables? Would she rather miss out on dessert than finish her greens? Check out the activities, coloring pages, books and videos below and share them with your children. Make veggies familiar to and fun for your kids. Maybe they’ll ask to try a food they haven’t tried before? Again–it doesn’t hurt to dream! 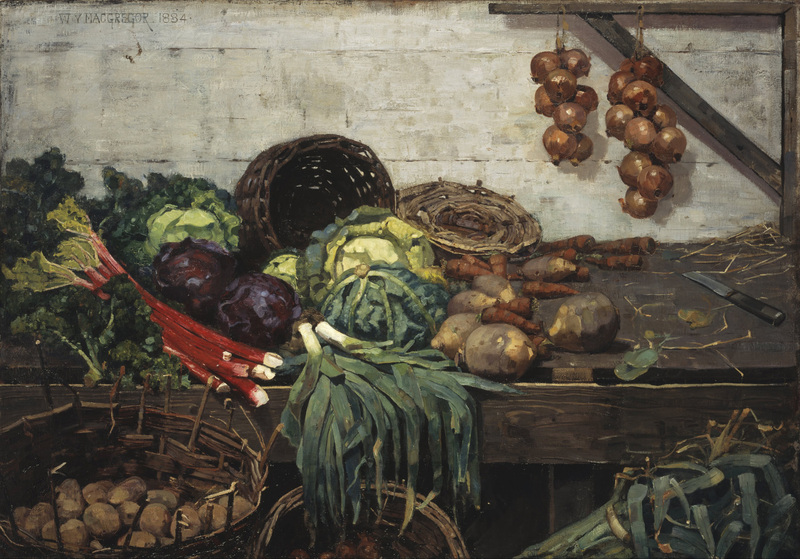 “The Vegetable Stall,” above, was painted by Scottish artist William York McGregor in 1884, when he was 29 years old. He was mostly known as a landscape painter, but this still life is considered his masterpiece. Click on the painting to enlarge the image. Look at it closely with your kids. How many different kinds of vegetables are in the painting? Which ones can they name? Which veggies are not familiar to them? Count the onions hanging from the rafters and the potatoes in the bin. What kind of recipes might use these ingredients? (I can almost taste a savory potato-leek soup and crunchy slaw….) Print out the painting and take it to the farmers’ market or the grocery store to see if your children can find and identify the “mystery vegetables.” Make it a game! This funny, energetic, Caldecott-Honor book, a retelling of an old tale of the American South, celebrates the trickster tradition of using one’s wits to overcome hardship. Lazy Bear and clever Hare are involved in a gardening partnership, with Hare agreeing to do the hard work on farm land that belongs to Bear. Hare is scrupulous about sharing the harvest equally, even letting Bear choose which part of the crop he wants–top or bottom. Yet somehow Hare always ends up with the half worth eating. Poor Bear never quite figures things out, but your kids will feel as clever as Hare when they see what’s coming! Ages 4-7. A classic in every sense of the word, this book was initially published privately because the author and illustrator, Beatrix Potter, couldn’t find a publisher. A year later, in 1902, an editor finally recognized its charm and appeal, and it’s been in print ever since. Translated into 36 languages and with 45 million copies sold, it’s one of the best-selling books of all time. The story follows a hungry rabbit with a mind of his own who sneaks into Mr. McGregor’s vegetable garden for a snack, even though he’s been told not to. Of course the gardener spots him, and a harrowing chase ensues. Peter eventually makes it home safely, where his mother serves him chamomile tea for a tummy ache (too many veggies!) and sends him to bed. Ages 4-8. Find out more about this wonderful story here. 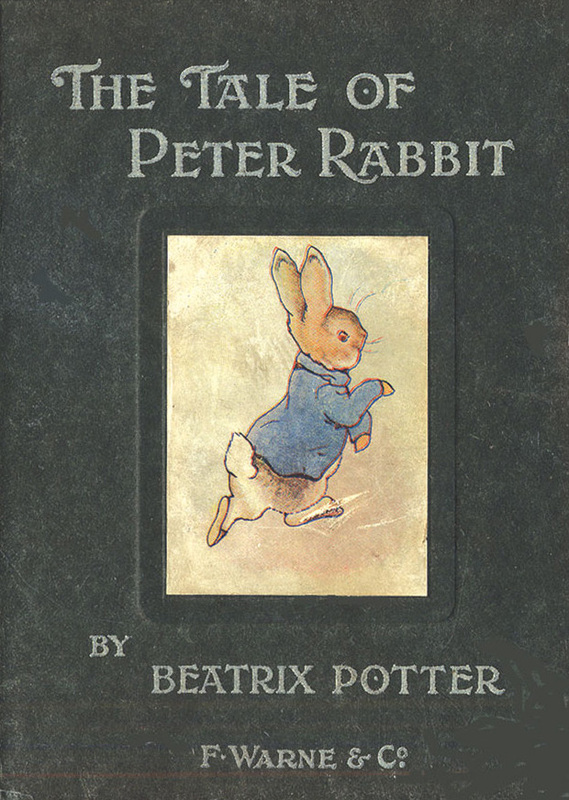 Your kids will enjoy learning that Miss Potter had a pet rabbit named Peter Piper when she was a girl, and that the story was first written for a young friend in a letter. Richard Tuttle is a K-12 music teacher in the tiny Ada-Borup School District in Minnesota’s Red River Valley. 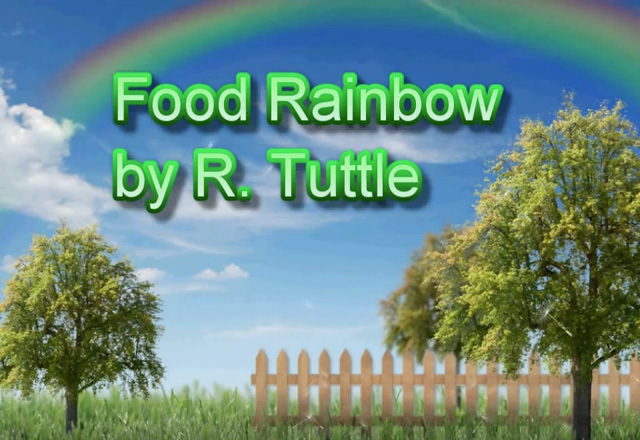 He wrote “Food Rainbow” for the kindergarteners–and I’m willing to bet after hearing it once, your kindergartener will want to sing along. And maybe she’ll be more interested in having a rainbow of food on her plate every day, too. You’ll need to follow the link to hear the song; the file is too large to post here. Carving vegetables requires a sharp knife, so you’d best do this activity on your own as your kids watch. They just might be so awed by your artistic talent they’ll absently reach for a carrot to munch on while you’re creating. I found these instructions with a quick search on youtube.com. If this turns out to be lots of fun, there are plenty more where this came from! 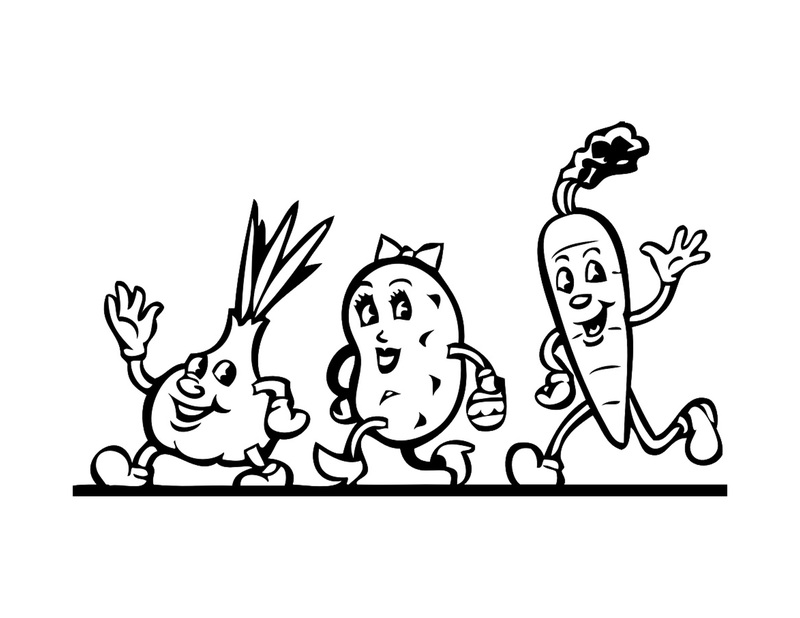 Photos used with permission via creativecommons.org: “The Vegetable Stall” and Peter Rabbit cover image, wikimedia; coloring pages, pixabay.com. Food Rainbow, Richard Tuttle. 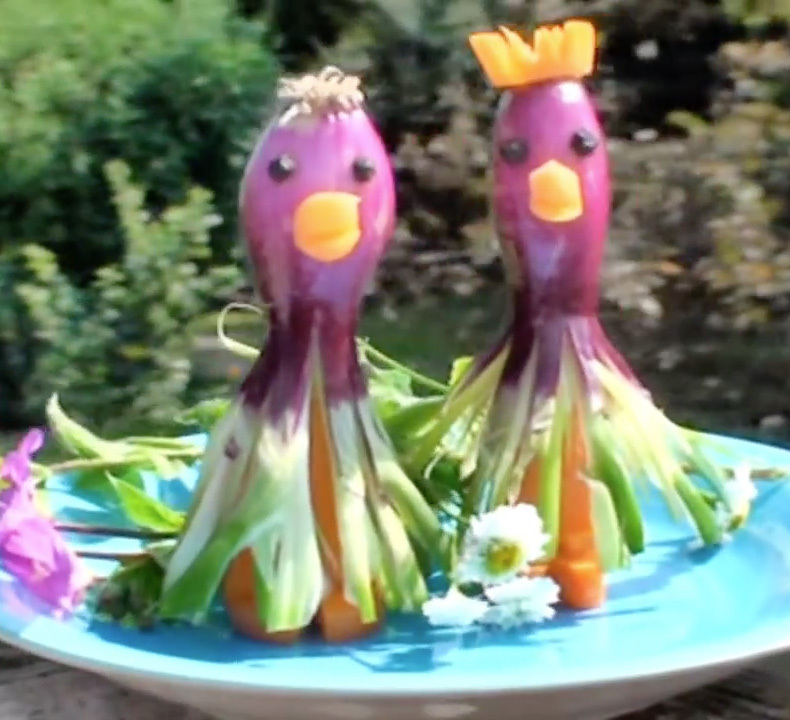 Veggie critters, ItalyPaul. 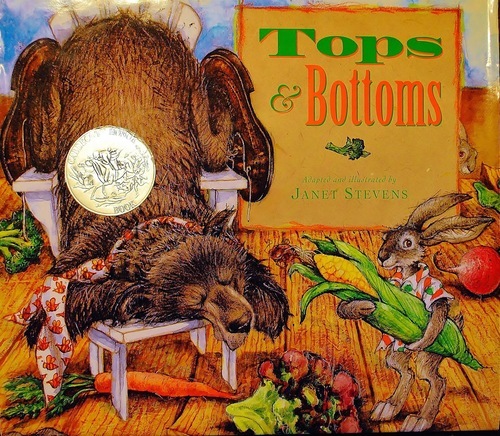 Tops & Bottoms cover image from amazon.com.